Mother’s Day is a great excuse for us to sing the praises of the latest mum from our department here at Red Letter Days. 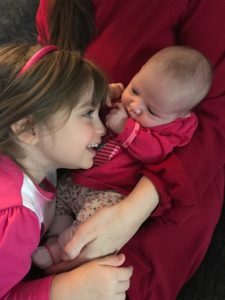 Hayley left recently to have her second daughter, and baby Charlotte was a big hit when she came into the office recently, with Hayley and big sister Annabelle. It goes without saying we abandoned our desks and Hayley and the girls became the centre of attention. Charlotte slept on despite a chorus of cooing around her, Annabelle showed us her funky shoes and excitedly announced that she would be 4 the following day. Hayley showed the calm and patience she is famous for as we sat her down for a proper interview to talk about the journey of motherhood. Are you sitting comfortably? Many congratulations Hayley on the birth of beautiful baby Charlotte. Thanks for coming in, and for agreeing to be our featured mum on the blog. Let us be the first to wish you a very happy Mother’s Day. We recently held a Twitter party and we asked What Do Mothers Want? What do you say Hayley? My ideal day off would be an afternoon tea, tied in with some retail therapy. I’d treat myself to some new clothes, stop at the cosmetics counters for a makeover or manicure and then sit down and indulge! Ooh, that sounds perfect. OK, a more serious question now. What would you say was the the biggest difference you noticed, as a second time around mum? The biggest difference for me is feeling less anxious and stressed about what she wants/needs. I have more confidence in my own instincts instead of listening to others advice. I feel more relaxed and I’m sure this has contributed to Charlotte’s chilled out nature. Plan ahead – as hard as this can seem when you are sleep deprived, getting organised is a must if you have two! Try and do jobs that will help things run smoother when you are in a rush, like packing the school bag or choosing clothes the night before. Also online shopping is a blessing if you can handle the headache of ordering! They say you forget how painful labour is. Is that true? 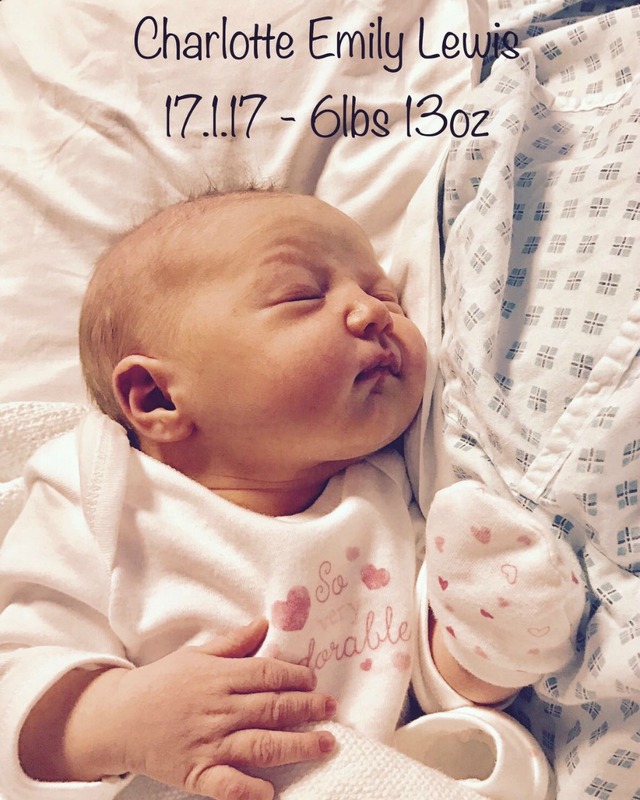 Annabelle was un-diagnosed breech until I was in labour and ended in an emergency C section, so I was given the choice throughout this pregnancy of either a natural birth or another C section. 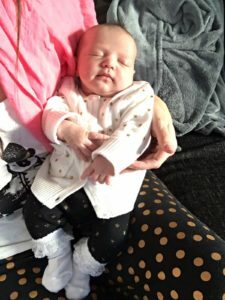 This time the baby was closely monitored and I had more scans to confirm she was ‘head down’ and in the correct position for a natural birth, which is what I began to plan for. As many mothers will know, it rarely goes to plan and after a long labour, things didn’t progress as they should have and another emergency C section was needed. How does having a cesarean affect you physically, could you pick up the baby straightaway? You can’t really do anything straight away, which is really hard and also quite upsetting. In the first few days you need to rely on the help of others to even pick up your baby and get out of the bed. It really made me feel lucky to have the support of my family and husband. How has your first child taken to the baby and how did you prepare her for her new sibling? Annabelle has been fantastic. I think the age gap (4 years) really helps as she is more understanding and really enjoys helping. We tried to prepare her by explaining as much as possible about how it will be, letting her ask questions and giving her a timeline of events leading up to the new arrival; e.g. Halloween, Christmas then baby! We also took her to an art cafe and let her choose and paint a gift for her new baby sister’s room. Is your baby happy in the company of family members, or does she need to be very close to you in the first few weeks? She seems to have a very chilled out nature and doesn’t mind who is cuddling her. 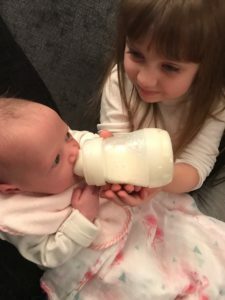 Let them help – this depends on the age gap, but letting my eldest girl Annabelle help and getting her involved in caring for the new baby has been a great way for her to bond with her new sister and feel included. It’s also really handy to have an extra pair of hands. Do you and your husband share baby chores? Yes, I am very lucky that Adam is happy to share the baby chores. We take it in turns to do the night feeds, nappy changes and do different activities with Annabelle on her days off from nursery. If your baby was in a room of 100 other babies, how would you know which one was yours (in other words how do you recognise one another)? You spend so long staring at them and examining every little inch of their little bodies that you know every little detail! Why is it that new mums don’t have a minute to themselves? I think it is because suddenly there is someone who needs you and you put their needs above your own. Everything revolves around them and you take a back seat. This means many cold cups of tea and make-up free days! What do you do if she cries and won’t stop? I am happy to report this hasn’t happened with Charlotte yet, but with Annabelle I was straight on the phone to mum! Keep them busy – one of the biggest challenges with having two children is keeping the eldest entertained. With the first you can just flop in front of daytime TV while baby naps, but when there are two, you don’t get a break! Choose activities to do together that are easy and fun – paper and pens or Playdoh to let them be creative. Lego is always a winner with the added bonus of no mess! Are you feeling at the moment that you would like to have another child, or haven’t thought that far? I am happy and very lucky to have my two girls. I will be stopping here! If your baby could talk, what do you think she might have to say? “Milk please” and she’d know all the lyrics to Frozen! Fit them in – you don’t have to change your lifestyle. Carry on and do the things you normally would. Baby number two should slot into your family not control it. This also helps to keep things from feeling too different for your first child, who could end up resenting their sibling if it means they can’t do their favourite things. Finally trust your instincts. You’ve done it before so trust what you learnt along the way and you’ll be much more relaxed around your new arrival.